In today’s world, it’s not surprising that more patients are concerned with the appearance of their smile. The desire to have a uniform smile is one of the most common goals patients express. While the traditional method of straightening teeth with metal braces may seem unappealing to many patients, newer technologies are allowing them to achieve straighter smiles discreetly. Our team at Eagle Creek Dental Centre provides Invisalign® clear braces in Burnaby for patients who wish to achieve beautifully aligned teeth. How Does Invisalign Braces Work? 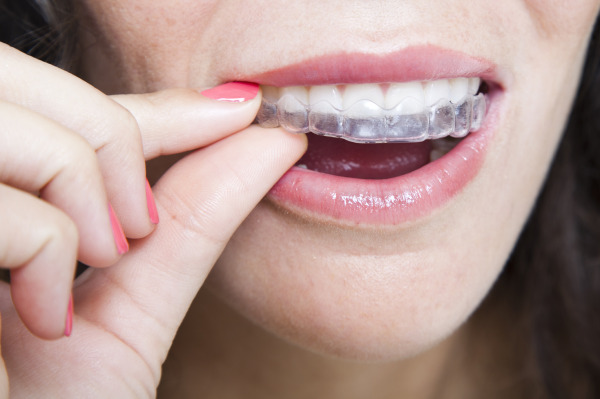 Invisalign clear aligner therapy uses custom molded trays to gradually shift a patient’s teeth. The process is closely monitored by our team at Eagle Creek Dental Centre to ensure treatment progresses as expected. Unlike traditional metal braces, Invisalign trays can be removed before cleaning routines and meals, which allows patients to eat more comfortably. The trays are also translucent; others won’t be able to tell you’re wearing braces. Who is an Ideal Candidate for Invisalign Trays? Invisalign orthodontics is a great treatment for patients with minor bite concerns. Patients who opt for Invisalign braces can expect the aligners to resolve overcrowding and gaps between teeth. Each treatment plan differs from the next, as no two patients’ smiles are identical. During the first phase, your dental professional will verify that you’re a suitable candidate for the treatment. Once your eligibility has been determined, the doctor will take detailed impressions and images of your teeth and bite. These are sent off to the Invisalign lab to create your series of aligners. Next, your dental professional delivers your first set of aligners. Check-up appointments are scheduled every six weeks to evaluate progress and determine whether the next series of aligner trays should be distributed. Once treatment is complete, you will receive a retainer to hold your teeth in their new position. Aesthetics aside, having straighter teeth can contribute to improved oral health. Straight teeth make it easier for patients to enunciate, chew, and bite, and brush and floss properly. And with an effective oral hygiene routine in place, you will be able to prevent several dental issues, such as periodontal disease. If you’re interested in learning more about Invisalign clear braces, don’t hesitate to give our office a call. The team at Eagle Creek Dental Centre looks forward to serving you. Call today for more information or to schedule an appointment!